Hammerton's handcrafted skier motif is a popular choice for mountain resort homes. Hammerton offers over 30 different finishes to coordinate with your favorite motif, including river rust. Our artisans can also hand-ink an illustration of your favorite sport on a fixture shade, as shown here. A detailed look at our skier motif in a semi-flush ceiling light. Hammerton can design motifs in a variety of settings. This light mica dining light with an autumn harvest finish brings the outdoors in. 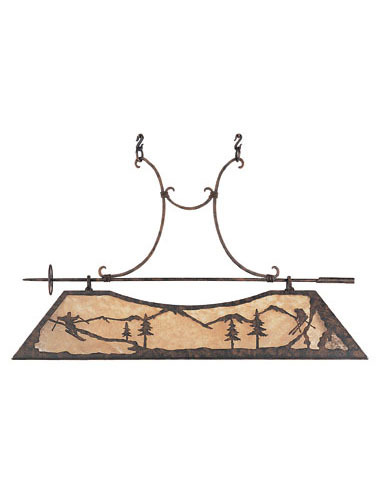 Mountain biker motifs can enhance the design of your custom light fixtures, both indoors and out. The 2014 Winter Olympic Games in Sochi, Russia are underway, and every four years this international sporting event sparks our passion for winter sports. Did you know that you can celebrate your favorite winter sport with a Hammerton light fixture? We offer beautiful handcrafted sports motifs as both standard and custom options on many fixtures in our Log & Timber collection, including the ones featured in the gallery above. Whether you’re a fan of alpine skiing, snowboarding or even figure skating or the biathlon, you can showcase your favorite sports in a living room chandelier, kitchen pendants, a front door sconce, or any space in or around your home. We also offer a variety of handcrafted sportsman motifs including fishing, mountain biking and bird hunting. If your light includes a rawhide shade, we can also incorporate hand-inked illustrations. Our skilled artisans can even customize your sportsman motif by placing it in a variety of settings. As with any of our motifs, sports-related themes can go well beyond the standard options seen in our catalog products. For more information or to discuss designing a custom sports motif for your luxury light fixture, contact us today. This Mediterranean-inspired wine cellar cleverly incorporates a grape branch motif into a decorative ceiling light. 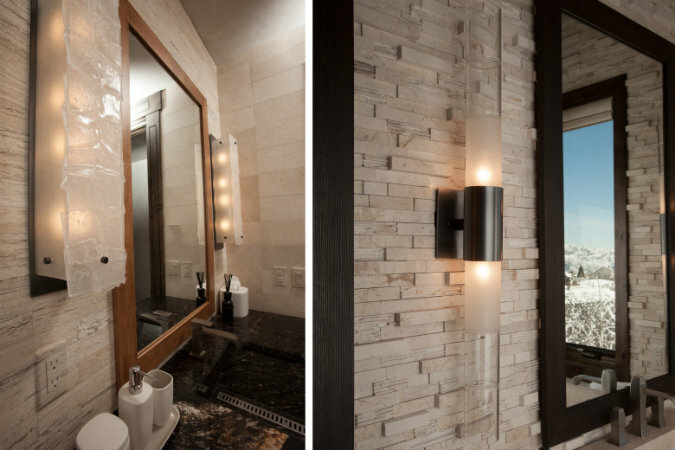 Textured glass (left) and bamboo-shaped glass cylinders (right) both add organic elegance and an artisan's touch to these bath fixtures. Custom mica drum chandelier accented with delicate organic sprays crafted from steel. This design detail expands the scale of the drum fixture to suit the space without adding any visual weight. This ornate chandelier, custom designed by Hammerton for the Ritz-Carlton Residences in Vail, Colorado, is a good example of incorporating wood to extend an organic aesthetic to a traditional design. With cascading 'aspen branches' made from sculpted and textured steel, this dramatic chandelier perfectly complements the natural surroundings of this contemporary log home. 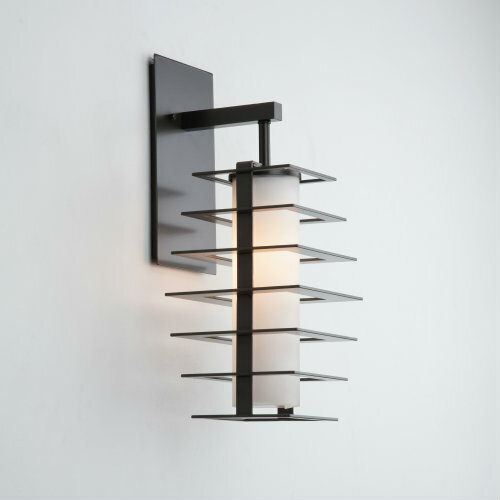 Contemporary sconce ID2155. Several of Hammerton's contemporary fixtures include standard backplate motifs like this stylized organic texture. Contemporary sconce CS2227 with a chive washi paper diffuser and hammered texture. Contemporary dining light PL2108 with a custom banana leaf weave lens and a premium light copper finish. The Hammerton Chateau chandelier CH9238 incorporates a subtle organic feel to a traditional European chandelier form. Shown here with light art glass cylinders, decorative banding and an antique bronze finish. 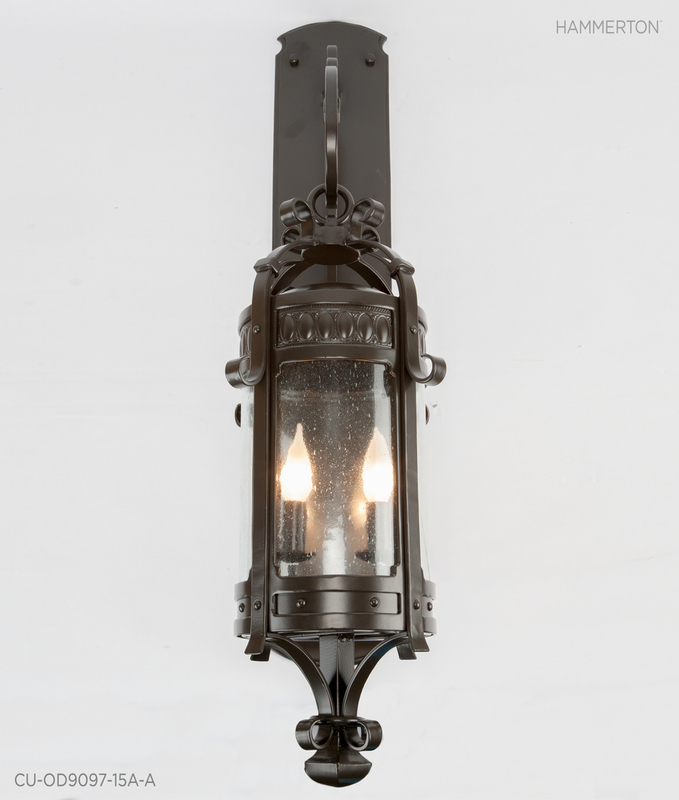 Complementary Chateau indoor sconce ID9249. BRING THE OUTDOORS IN, WHATEVER YOUR STYLE! To many, the idea of ‘organic lighting’ conjures up images of heavy rustic chandeliers featuring silhouettes of evergreen trees or pine cone-laden boughs. But organic themes aren’t just for rustic lights! With thoughtful design and creative use of natural materials, textures and forms, organic elements can add personality, warmth and artisan detail to any interior style. As you can see here, Hammerton designers frequently incorporate subtle nods to the outdoors using organic lens materials, fabrics, hand-made textures and other elements. Designs span the style range from traditional to contemporary. While many organic elements are included as standard options on catalog products, we also routinely work with customer-specified materials and themes. Hammerton offers a broad selection of beautiful organic motifs as standard options. Hand-sculpted from steel by our talented artisans, these include authentically textured branches adorned with grapes, acorns, maple, aspen and oak leaves, and other organic motifs. We also offer bronze animal sculptures, hand-inked illustrations and other artistic accents. Yes, organic-inspired lighting can add warmth and elegance without a “frontier feel.” Take a look at the gallery above to view examples of lights featuring our standard and custom organic motifs and accents. For more information or to discuss designing a custom organic motif for your luxury light fixtures, contact your Hammerton representative. The antique iron finish on this outdoor light fixture nods to the beautiful palette of natural wood and stone materials in this garage facade..
Hammerton outdoor fixtures can be pre-treated with a proprietary process that withstands winter’s wrath, including layers of wet snow. This ceiling light is able to hold up against freezing mountain temperatures during the long winter months. The beauty of a Hammerton outdoor finish adds both aesthetic value and durability to this contemporary mountain home. Eclectic light fixtures add visual interest to outdoor living spaces. Matching outdoor wall sconces and a pendant fixture from the Hammerton Log & Timber Collection beautifully complement the burly posts in this rustic entryway. A row of traditional outdoor light fixtures from Hammerton's Chateau Collection adds a sense of old world sophistication to this garage facade. BEAUTIFUL OUTDOOR FINISHES THAT LAST? YOU BET! 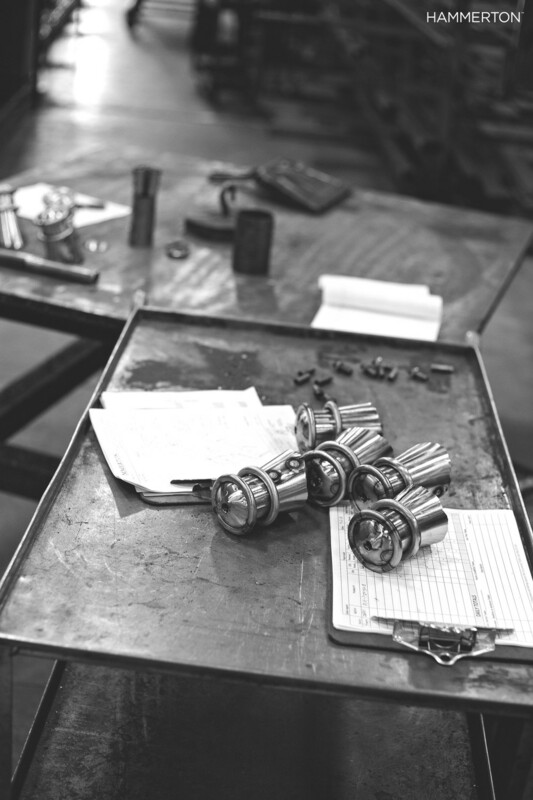 As we’ve mentioned in previous posts and on our website, Hammerton uses sophisticated pre-treatment and multi-coat finish processes – such as zinc and chromate coatings and AAMA-certified finishes — to provide the industry’s highest standard of durability. But we do this without sacrificing aesthetics at all. In fact, our exterior finishes provide the same richness, depth and character as our interior finishes, so you can maintain the same beautiful look inside and out. Our collection of 16 standard flat and mottled outdoor finishes rival the most sophisticated patinas. We can also provide an almost infinite number of custom outdoor finishes. A quick glance at the gallery above will prove that with Hammerton outdoor lighting you don’t have to compromise aesthetic appeal for durability. This is not your average boathouse. This Adirondack style boathouse nestled on Minnesota’s Nisswa Lake just north of Brainerd is simply spectacular. Designed by Marie Meko of Gabberts Design Studio, , the boathouse design was inspired by the owner’s deep Nisswa Lake roots and his affinity for classic wooden boats. A tree trunk frame and bark-on wood siding makes the boathouse appear as if it grew right out of the rich Nisswa ground. This organic feel endures as you enter the interior. An octagonal pavilion great room designed after a 19th century French chalet surrounds you with whimsical tree house-style architecture with artfully incorporated Minnesota cedar twig. A grand cedar staircase of limbs, burls and branches appears to sprout out of the pavilion floor as it gracefully twists and turns upwards to an office and sleeping quarters. Montana glacier stones and live lichen surround the fireplace, and diamond-shaped birch bark and red willow twigs accent each light fixture, custom designed by Hammerton. All this and we have yet to get to the boats! The classical boat display area spans 8,400 square feet and features 26-foot-high vault ceilings that appear to be supported by a 30-foot old growth red cedar tower. Five automated double doors open up to five boat slips where the boats appear to be sitting in the water but are operated via a remote controlled in-ground cable track system. The vibrant colors and lush new life of spring has inspired us to reflect on one of the most unique artistic collaborations that Hammerton has had the honor of being a part of – the Montrone Legacy Gardens. This one-of-a-kind, multi-million dollar landscape project, designed to serve as a backyard entertaining space for a private Salt Lake City residence, is a true work of art in nature and the collaborative product of three Utah companies: Pendleton Design Management, NightVision Landscape Lighting, and Hammerton. We’d love to hear what you think of our unique approach to lighting the magical Montrone Legacy Gardens. Share your thoughts in a comment below! To learn more about Montrone Legacy Gardens, we recommend visiting Robert McArthur’s blog to read his recent post on the project. 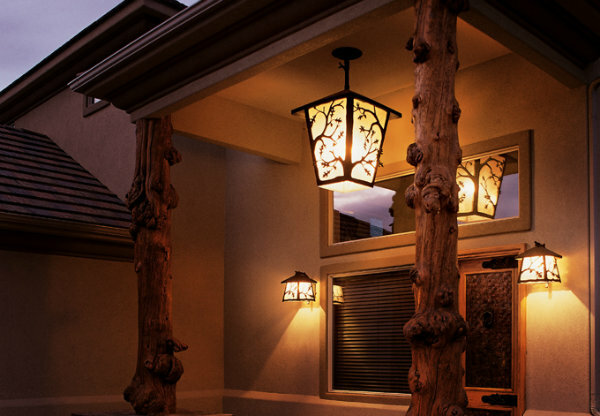 Decorative outdoor lighting is an investment. Just like interior light fixtures, cabinetry, hardware, and other finishes and furnishings, outdoor lights are expected to retain their beauty and functionality for years to come. But more often than not, outdoor fixtures quickly lose their visual appeal entirely as a result of the elements. Particularly on the coasts, in the mountains, or on the sunbelt where life is lived outside, outdoor fixtures face tough climate factors such as moisture, UV rays, corrosive ocean air, freezing temperatures, and ice. The enormous popularity of outdoor living spaces makes the need for high performance outdoor lighting greater than ever. Unfortunately, most outdoor light fixtures are selected purely based on style and scale. With little consideration given to the performance capability of the finish, homeowners are often surprised at how soon their fixtures show visible signs of wear and tear. In fact, fixtures with low quality finishes can start to fade, chip, and even corrode after only one season. 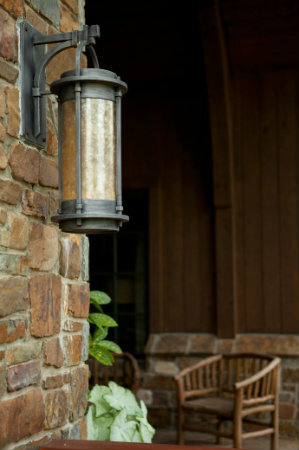 The vast majority of outdoor lighting finishes available today offer either aesthetics or durability. Very few provide both. Fixtures finished with liquid paints are often stylish, but they are also extremely delicate. Fixtures finished with powder coats offer long-lasting durability, but are usually lackluster in the style department. In reality, it’s not at all easy to achieve a durable, long lasting finish that also provides beautiful color, depth, and character. But Hammerton has a solution. In fact, we have several! We have pioneered a proprietary, multiple-coat process that allows us to offer 16 richly colored outdoor finishes that provide incredible visual interest. Compared to most available on the market today, Hammerton finishes are vastly superior in style as well as durability and longevity. By combining the aesthetics of traditional wet paint with the performance of powder coat, our outdoor finishes offer beauty, durability, weather resistance, and even environmental compliance. View our selection of gorgeous outdoor lighting online. Remember that you can scale any of our fixtures or adapt its style to perfectly suit your space and your personal taste. For help in selecting or designing fixtures, speak to a Hammerton lighting expert at 801.973.8095.